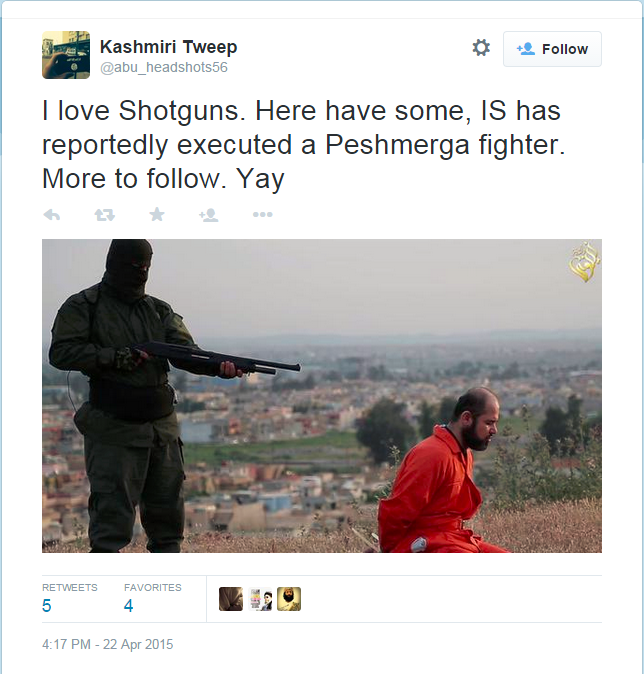 Kashmiri Tweep is an ISIS propagandist on Twitter operating with the handle @abu_headshots56. Tweep praises ISIS victories and lambastes the U.S.-led coalition fighting ISIS for causing civilian casualties.Kashmiri Tweep, Twitter post, June 11, 2015, 1:08 p.m., https://twitter.com/abu_headshots56/status/609044465622355970. His posts also condemn kuffar (nonbelievers) and “coconuts,” a derogatory term used by jihadists to deride moderate or assimilated Muslims. Tweep accuses Western “crusaders” of targeting women and childrenKashmiri Tweep, Twitter post, June 11, 2015, 1:00 p.m., https://twitter.com/abu_headshots56/status/609042648377114625. and condemns “moron moderate Muslims” who support the anti-ISIS coalition.Kashmiri Tweep, Twitter post, June 11, 2015, 12:59 p.m., https://twitter.com/abu_headshots56/status/609042337948246016. Tweep’s nationality and exact location are unknown. He has claimed in various Twitter profiles to be in Sweden, Dallas, Texas, and Illinois. In an April 18, 2015, post about “news from back home,” he wrote about Indian forces shooting a teenager, implying that “home” might be India. Tweep claims to be a PhD student.Kashmiri Tweep, Twitter post, April 19, 2015, 9:24 a.m., https://twitter.com/abu_headshots56/status/589827019623571457. He has tweeted that he will owe “kuffar” nothing when he finishes,Kashmiri Tweep, Twitter post, April 19, 2015, 9:24 a.m., https://twitter.com/abu_headshots56/status/589827019623571457. indicating that he is in a Western university program. On May 23, 2015, he asked his followers to pray for him to get into an unspecified medical school.Kashmiri Tweep, Twitter post, May 23, 2015, 4:22 a.m., https://twitter.com/abu_headshots56/status/602026723169988608. His April 30, 2015, post about “legit medical colleges in IS”Kashmiri Tweep, Twitter post, April 30, 2015, 1:02 p.m., https://twitter.com/abu_headshots56/status/593822672686952448. raises the question of whether his May 23 plea refers to his acceptance into an ISIS-affiliated school. 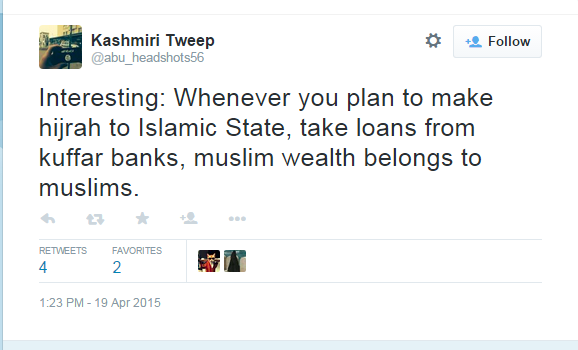 Despite his regular calls for “hijrah” (immigration) to ISIS territory, Tweep encourages his followers to take advantage of government loans and “kuffar banks” to fund their activities.Kashmiri Tweep, Twitter post, April 19, 2015, 1:23 p.m., https://twitter.com/abu_headshots56/status/589841835633221633. Mujahid Miski replied to another post that Tweep should take government money.Kashmiri Tweep, Twitter post, April 19, 2015, 9:24 a.m., https://twitter.com/abu_headshots56/status/589827019623571457. Tweep communicates through Twitter with other Islamist propagandists and recruiters such as Miski.Kashmiri Tweep, Twitter post, April 19, 2015, 9:24 a.m., https://twitter.com/abu_headshots56/status/589827019623571457. 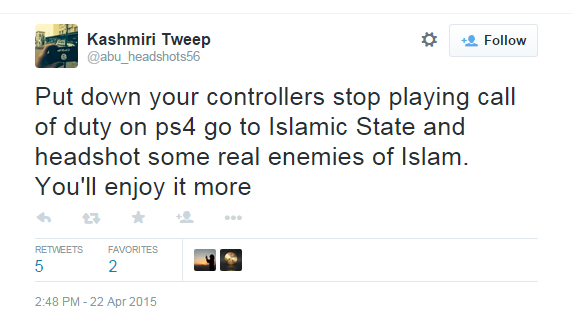 An April 22, 2015, tweet seemingly targeted westernized Muslims, telling them to “stop playing call of duty on ps4” and go to ISIS-held territory to “headshot some real enemies of Islam” because they will “enjoy it more.”Kashmiri Tweep, Twitter post, April 22, 2015, 2:48 p.m., https://twitter.com/abu_headshots56/status/590950391098974209. Tweep is aware that Twitter and authorities are monitoring his accounts. 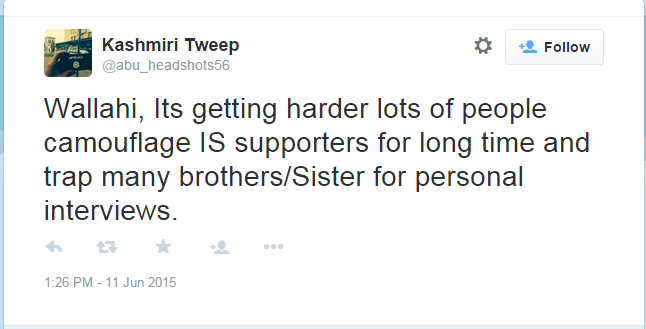 He has posted advice for other ISIS supporters on how to avoid detections and honeypot traps. An April 29, 2015, tweet mocked “spies” who “tried real hard” to figure out Tweep’s location.Kashmiri Tweep, Twitter post, April 29, 2015, 7:04 a.m., https://twitter.com/abu_headshots56/status/593370305575391232. He warned on April 22, 2015, that Twitter was removing “baqiyah” (ever-lasting) profiles.Kashmiri Tweep, Twitter post, April 22, 2015, 3:19 p.m., https://twitter.com/abu_headshots56/status/590957996013813760. He told his followers to “reshuffle your usernames and spread haqq” (truth).Kashmiri Tweep, Twitter post, April 22, 2015, 3:19 p.m., https://twitter.com/abu_headshots56/status/590957996013813760. In his first post under his new account on April 17, Tweep wrote account suspensions are “part of the experience here. We love it.”Kashmiri Tweep, Twitter post, April 17, 2015, 1:27 p.m., https://twitter.com/abu_headshots56/status/589118017965002753. 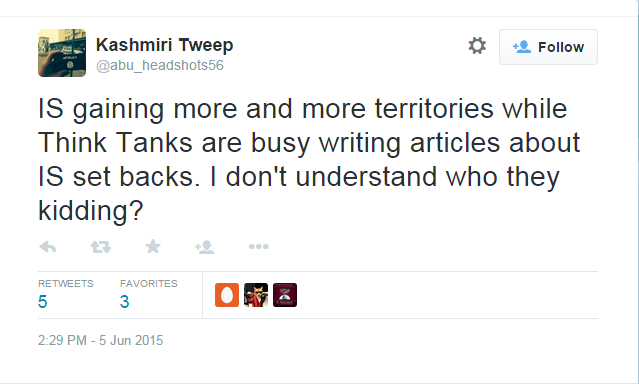 @Abu_headshots56Kashmiri Tweep, Twitter, accessed June 11, 2015, https://twitter.com/abu_headshots56. @abu_headshot102Kashmiri Tweep, Twitter, accessed June 11, 2015, https://twitter.com/abu_headshots56. @abuheadshotsKashmiri Tweep, Twitter, accessed July 27, 2015, https://twitter.com/abuheadshots. @joindawlahKashmiri Tweep, Twitter page, accessed September 16, 2015, https://twitter.com/joindawlah. 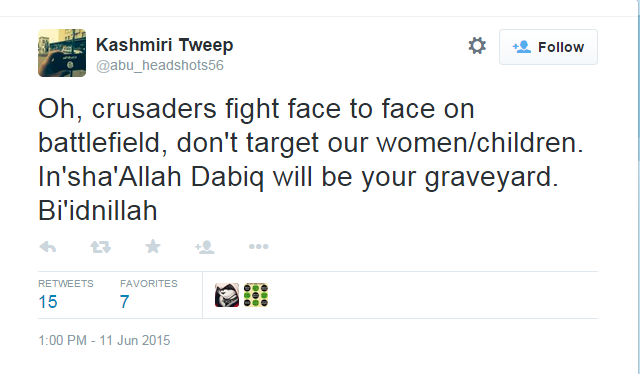 Kashmiri Tweep is an ISIS propagandist on Twitter operating with the handle @abu_headshots56. “Remember how our khilafah started from being in baby shoes and now we're here declaring economic war against US. Absolutely spot on! Baqiyah”Kashmiri Tweep, Twitter post, August 28, 2015, 11:25 a.m., https://twitter.com/abuheadshots/status/637330100489449472. “Shami, Amreeki lots of more baqiyah people went to jail for this thing twitter. Don't let kuffar win, keep your tweets coming like a storm.”Kashmiri Tweep, Twitter post, August 28, 2015, 10:52 a.m., https://twitter.com/abuheadshots/status/637321828244037632. “Its time for dawlah to boil the bodies of these Ahrār ash-Shām dogs. Kill hang burn them give them worst death possible.”Kashmiri Tweep, Twitter post, August 27, 2015, 12:00 p.m., https://twitter.com/abuheadshots/status/636976612097916928. “BaitullahMehsudCarvan, Waziristan pledged allegiance to Islamic State, Khorasan Province. This brings shivers down the spines of kuffar”Kashmiri Tweep, Twitter post, August 3, 2015, 9:19 a.m., https://twitter.com/abuheadshots/status/628238754008817664. “Oh, Enemies of Islam pack your bags and run. Lions of Islam are coming to slaughter your soul.”Kashmiri Tweep, Twitter post, July 28, 2015, 12:51 p.m., https://twitter.com/abuheadshots/status/626072429220249600. “ALLAH HU AKBAR! Story about 3 IS mujahideen who stormed the prison liberated 100s of prisoners. LIONS WALLAHI”Kashmiri Tweep, Twitter post, June 11, 2015, 1:45 p.m., https://twitter.com/abu_headshots56/status/609053914462326784. “Wallahi, Its getting harder lots of people camouflage IS supporters for long time and trap many brothers/Sister for personal interviews.”Kashmiri Tweep, Twitter post, June 11, 2015, 1:26 p.m., https://twitter.com/abu_headshots56/status/609049156888502273. “Sad to hear about arrest of our brother Amreeki Witness. Please make du’a for him. May Allah make it easy for him. Ameen”Kashmiri Tweep, Twitter post, June 11, 2015, 1:19 p.m., https://twitter.com/abu_headshots56/status/609047229681291264. “I don’t understand why so many brothers are getting arrested? There are tons of material you can use on internet to keep yourself safe?”Kashmiri Tweep, Twitter post, June 11, 2015, 1:15 p.m., https://twitter.com/abu_headshots56/status/609046223484542976. “Coalition war planes killed IS commander. Congratulations Moderate “Muslims”, Palace $cholars this is in your name.”Kashmiri Tweep, Twitter post, June 11, 2015, 1:08 p.m., https://twitter.com/abu_headshots56/status/609044465622355970. “Oh, crusaders fight face to face on battlefield, don’t target our women/children. In’sha’Allah Dabiq will be your graveyard. Bi'idnillah”Kashmiri Tweep, Twitter post, June 11, 2015, 1:00 p.m., https://twitter.com/abu_headshots56/status/609042648377114625. “Coward crusaders can’t even find a single IS fighter on radars they just kill innocent babies/women and moron moderate muslims back them up.”Kashmiri Tweep, Twitter post, June 11, 2015, 12:59 p.m., https://twitter.com/abu_headshots56/status/609042337948246016. “Obama has setup special cyber teams to counter us. Don’t even think about leaving twitter. We’re giving them hard time. Bi’idnillah”Kashmiri Tweep, Twitter post, June 9, 2015, 1:58 p.m., https://twitter.com/abu_headshots56/status/608332254679580672. “Nowadays Coconuts are busy designing new towns in their dreams where IS gets defeated by Shia heretics. Keep dreaming faggots. Hhh”Kashmiri Tweep, Twitter post, June 7, 2015, 2:15 p.m., https://twitter.com/abu_headshots56/status/607611812532613120. “Calm down, many people are supporting dawlah cus they are gaining territories but when they loose one, people change their aqeeda. Morons.”Kashmiri Tweep, Twitter post, June 5, 2015, 2:43 p.m., https://twitter.com/abu_headshots56/status/606894242489892864. “IS gaining more and more territories while Think Tanks are busy writing articles about IS set backs. I don’t understand who they kidding?”Kashmiri Tweep, Twitter post, June 5, 2015, 2:29 p.m., https://twitter.com/abu_headshots56/status/606890525728374784. “You know whenever IS advances in Khurasan. It brings smile to faces joy to hearts cus both Indian/Pak Army oppressed our brothers for ages.”Kashmiri Tweep, Twitter post, June 5, 2015, 2:12 p.m., https://twitter.com/abu_headshots56/status/606886387602882561. 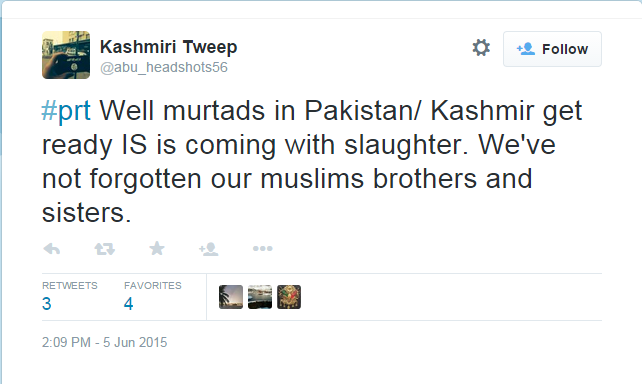 “#prt Well murtads in Pakistan/ Kashmir get ready IS is coming with slaughter. We’ve not forgotten our muslims brothers and sisters.”Kashmiri Tweep, Twitter post, June 5, 2015, 2:09 p.m., https://twitter.com/abu_headshots56/status/606885674843828224. “Hamas Joining hands with Israel against IS. Can’t believe how cheaply hamas sold their religion.”Kashmiri Tweep, Twitter post, June 4, 2015, 8:28 a.m., https://twitter.com/abu_headshots56/status/606437431907368960. “We baqiyyah people have the last laugh when kuffar makes fun of moderate ‘muslims’ when these turncoats lick their boots. They deserve it.”Kashmiri Tweep, Twitter post, June 2, 2015, 2:57 p.m., https://twitter.com/abu_headshots56/status/605810513289682945. “You know its really funny when you keep getting suspended on twitter you decide to change your aqeeda.”Kashmiri Tweep, Twitter post, June 2, 2015, 2:55 p.m., https://twitter.com/abu_headshots56/status/605810033964638209. “Hamas raided the home of Abū Khattāb/ Yūnus al-Hunr & shot his head. Palestine will not be free untill they get rid of Hamas. Corrupt groups”Kashmiri Tweep, Twitter post, June 2, 2015, 2:12 p.m., https://twitter.com/abu_headshots56/status/605799149687074816. “Kashmir, Palestine, Burma Do you know why we're suffering cus we abandoned Jihad and Sharia. We Believed in democracy. Allah humiliated us.”Kashmiri Tweep, Twitter post, May 21, 2015, 1:56 p.m., https://twitter.com/abu_headshots56/status/601446434571825153. “Lot of kuffar guys think in IS english/Science is banned. Well, we got legit medical colleges in IS. Does that ring a bell?”Kashmiri Tweep, Twitter post, April 30, 2015, 1:02 p.m., https://twitter.com/abu_headshots56/status/593822672686952448. 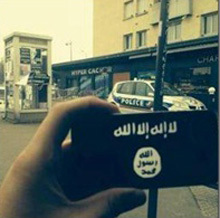 “Spies tried real hard to get my location using my time zone but then again they got trolled. Even digitally you're loosing this war. Hhh”Kashmiri Tweep, Twitter post, April 29, 2015, 7:04 a.m., https://twitter.com/abu_headshots56/status/593370305575391232. “Put down your controllers stop playing call of duty on ps4 go to Islamic State and headshot some real enemies of Islam. You'll enjoy it more”Kashmiri Tweep, Twitter post, April 22, 2015, 2:48 p.m., https://twitter.com/abu_headshots56/status/590950391098974209. “If someone opens his/her filthy mouth abusing our caliph, give them no space block/report right away.”Kashmiri Tweep, Twitter post, April 20, 2015, 2:27 p.m., https://twitter.com/abu_headshots56/status/590220295786500096. “Interesting: Whenever you plan to make hijrah to Islamic State, take loans from kuffar banks, muslim wealth belongs to muslims.”Kashmiri Tweep, Twitter post, April 19, 2015, 1:23 p.m., https://twitter.com/abu_headshots56/status/589841835633221633. “Twitter, now we are not even mad. Suspension is part of our experience here. We love it. Meanwhile SUPPORT my account”Kashmiri Tweep, Twitter post, April 17, 2015, 1:27 p.m., https://twitter.com/abu_headshots56/status/589118017965002753.